Kicking World & EuroKickers will hold the first ever international football (American) kicking camp on Saturday & Sunday, August 03-04, 2013 in Bolzano, Italy. American kicking coach Brent Grablachoff, founder & head coach of Kicking World in San Diego, California (USA), the leading instructional kicking, punting & snapping provider in the United States has teamed up with European kicking coach Christoph Kipperer, founder of EuroKickers in Graz, Austria (Europe) to hold the first ever international football (American) kicking camp to take place on Saturday & Sunday, August 03-04, 2013 in Bolzano, Italy. The International kicking camp is a rare opportunity for European American football players to showcase their skills in front of an American coach with direct connections into college football programs across the United States. Specialists attending this camp will learn & improve in their football kicking & punting fundamentals, technique, and form. Any students attending camp who possess the ability to play at the next level, whether it be collegiately in the states or perhaps professionally in the United States or Canada, will have a fair chance at getting noticed and taking it to the next level. Kicking World has a rich history of students who attend their training programs to later play at the next level in college and beyond. 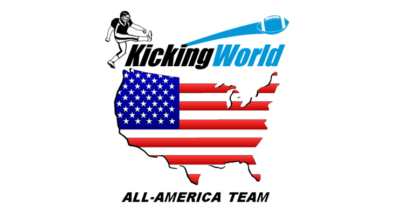 In 2013 alone, Kicking World placed over 18 high school senior kickers, punters and snappers into Division 1, Division 1AA and Division II collegiate football programs on partial and full college football scholarships. The teaming of EuroKickers and Kicking World for this International kicking camp will help European kickers and punters get recognized for their talents and create a direct in for them into collegiate and professional football organizations. Coach Brent Grablachoff is a professional kicking coach based in San Diego, California (USA) who founded Kicking World, the premier source of personalized kicking, punting, and snapping instruction for specialists of all ages and skill levels. He and his staff travel the country offering over (20) annual national kicking camps that teach aspiring specialists the techniques & fundamentals essential to improving their game. He holds year-round private lessons in Southern California. Coach Christoph Kipperer is a kicking coach based in Graz, Austria (Europe) who founded EuroKickers, the source for European kickers & punters of all ages and skill levels. He also is a coach of the JCL Graz Giants and the Austrian National Team. EuroKickers holds kicking camps throughout Austria and surrounding countries. They teach students the fundamentals & techniques of successful kicking & punting.